This dish is quick, easy, nutritious, deliciously tempting, and works with greens of all sorts. 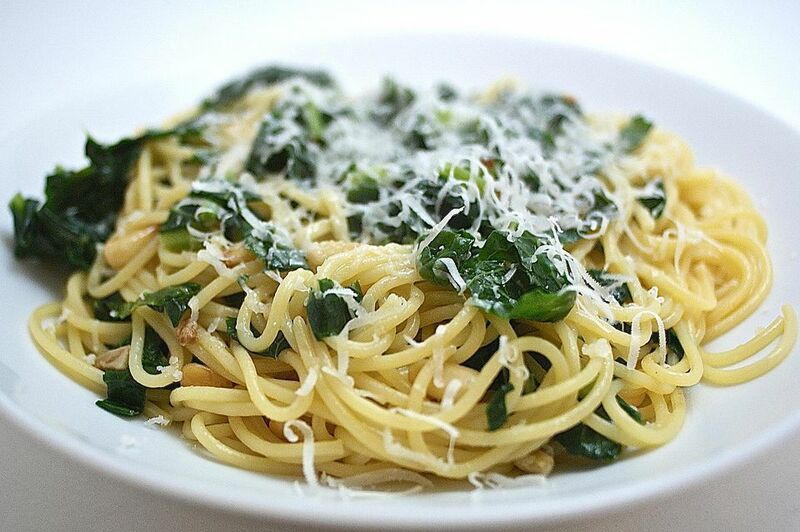 Our favorite green here is a lacianto kale, often called dino kale, Tuscan kale, or black kale—blanch it and then cut it into thin ribbons to tangle in with the pasta. Regular kale, Russian kale, Swiss chard, collard greens, or turnip greens are all great options too. Want a bit of kick? Try mustard greens. Use the same pot of water to blanch the greens before boiling the pasta and then cooking the whole dish in said pot for minimal clean-up. Bring a large pot of water to a boil. Meanwhile, trim and wash greens, leaving the leaves whole. Add 1 tablespoon of salt to boiling water. Add greens and blanch until wilted, from 30 seconds for chard to 2 minutes for lacianto kale, use tongs or a slotted spoon to remove the leaves to a colander and rinse them under cool water. Boil pasta until tender to the bite. Drain reserved 1/2 cup of the cooking liquid and set aside. Meanwhile, chop anchovies, if using, garlic, and cooked greens. Once pasta is drained, return the pot to medium-high heat. Add oil, garlic, pepper flakes, if using, and anchovies, if using. Cook, stirring until garlic turns just the tiniest bit golden. Add chopped greens and stir to combine. Add reserved liquid and bring to a boil. Add pasta, stir to combine, and bring to a boil. Take off heat. Stir in half of the shredded cheese. Taste and add salt to taste, if you like. Divide between plates or pasta bowls, garnish with remaining shredded cheese and serve.